Compact head provides better control. 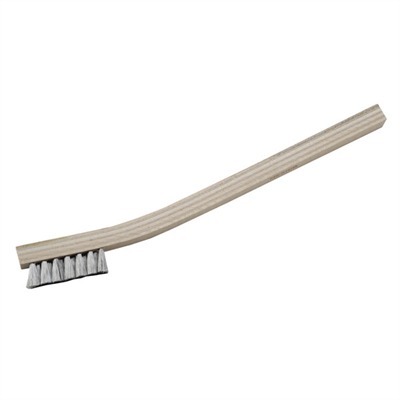 Three rows of soft, .003", stainless steel bristles won’t scratch through existing caustic blued finishes. 7-ply, laminated, hardwood handle. SPECS: .003" (.07mm) diameter bristles, 7⁄16" (11mm) long, 3⁄8" (9.6mm) wide, 1-3⁄8" (3.5cm) long, 7¾" (19cm) long overall.